Here at The Healing Station, I am always looking for more ways to help your skin look and feel more beautiful, youthful, and pampered. 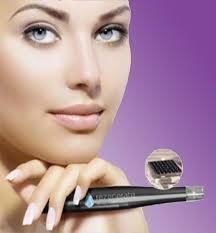 So I’d love to tell you about a new innovative skin care tool we now offer for the ultimate facial experience. As you may already know, I am addicted to making anyone’s skin look amazing, and the Regenerate Wand Treatment is a great way to make that happen. It’s celeb-worthy and used in some of the country’s most exclusive salons and spas, so why not right here in Folsom? 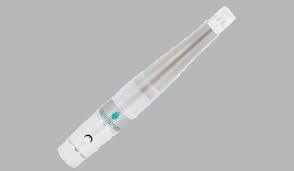 The Rezenerate Wand is a non-invasive handheld tool designed to deliver nutrients to your skin without pain or discomfort. The device is armed with a silicon chip and uses nanotechnology and microscopic, high-grade silicon pyramids to diminish puffy eyes, dark spots and wrinkles, and the treatment requires no down time (meaning you can literally just get up and go or apply your makeup once you’re done without waiting for any redness to subside, unlike other delivery systems). I then follow the treatment with a cooling balm and continue with your facial. The best part? When I hand you a mirror to see your transformed skin, now sporting a stunning glow. This is one of the newest skin care technologies around and what’s also great about it (for both me and for my clients) is that it is entirely “product-neutral.” That means that I can use any of the magical products and nutrients I use to customize your facial experience and the tool will still work wonders. It works well in dealing with fine lines, blemishes, malnourished skin, sun spots, uneven skin tone, and even oily or overly dry skin. You should consider a Rezenerate facial especially if your specific skin tone precludes you from considering an invasive procedure. Not only that, if you want quick results, then this is also the perfect facial for you to consider. This is the best way for you to maintain a vibrant and healthy looking skin. As I use the Rezenerate Wand, I walk you through what I am doing every step of the treatment so you feel comfortable and know what’s going on, something even my veteran clients enjoy hearing about, let alone those new to the facial experience. While the Wand treatment isn’t painful, I do prepare you for a tad of ticklishness and the prospect of your skin feeling tingly in spots. But no worries! That tingle means the nutrients I’ll apply next have just been given full permission to permeate secondary skin layers, remaining open to more nutrient permeation for several days afterward (which is why I encourage you to use your best night cream and eye cream as a habit for the next few days in order to get maximum results). Over the course of the following week, your skin should feel soft and plump. So if you are looking for a pain-free cosmetic alternative to harsh treatments and procedures, this may be the facial for you. For more information or to book your facial, call 916.294.9980 or make your appointment online using the tab at the top of our web page.